NETWORK FINALS: There were no changes from the early numbers for Friday. CABLE HIGHLIGHTS: Sports continued its reign over cable, with Fox Sports 1’s MLB PLAYOFFS game on top at 1.56. ESPN’s COLLEGE FOOTBALL doubleheader was at 0.80/0.76. The top-rated non-sports telecast was the return of Discovery’s GOLD RUSH at 0.72, with a lead-in special at 0.43. A&E’s LIVE PD dropped a tenth to 0.53. On Nickelodeon, SPONGEBOB returned at 0.47, with lead-out LOUD HOUSE at 0.45. Adult Swim’s early-morning segments of WILLIAMS STREAM were at 0.36/0.31, compared to last week’s 0.34/0.30. Disney Channel’s RAVEN’S HOME dipped 0.02 to 0.25. MSNBC’s RACHEL MADDOW SHOW led cable news at 0.25/0.38/2.4M, with Fox News’s FOX & FRIENDS at 0.24/0.38/2M, and CNN’s ANDERSON COOPER 360 at 0.18/900K. ID’s DEADLY WOMEN was at 0.24. 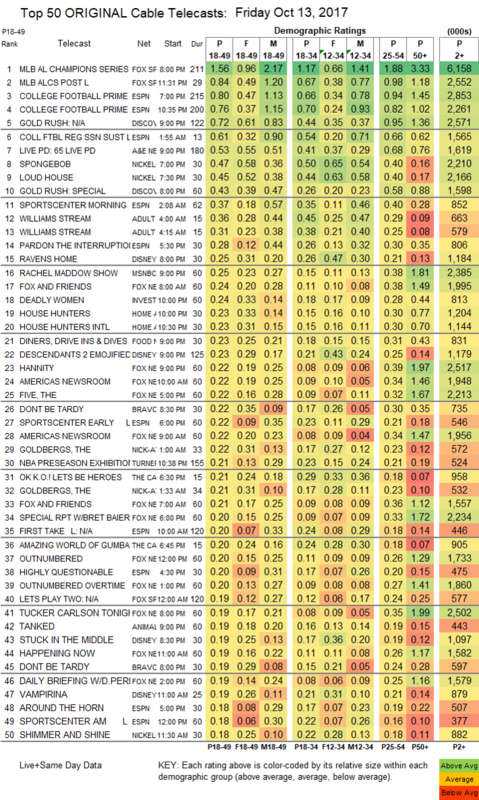 On HGTV, HOUSE HUNTERS and HOUSE HUNTERS INTL were both at 0.23, respectively up 0.04 and 0.02. Food Channel’s DINERS, DRIVE-INS & DIVES lost 0.02 to 0.23. Bravo’s DON’T BE TARDY was at 0.22/0.19, compared to last week’s 0.23/0.22. Syfy’s Z NATION gained 0.02 to 0.17. We’s MARRIAGE BOOT CAMP returned at 0.13. 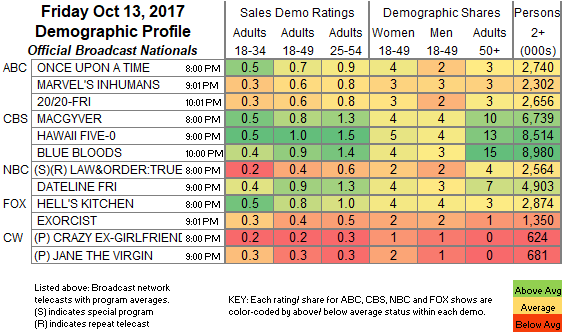 On TLC, KINDRED SPIRITS ticked down to 0.09, and EVIL THINGS ticked up to 0.08. The season finale of HBO’s ROOM 104 fell 0.02 to 0.06.